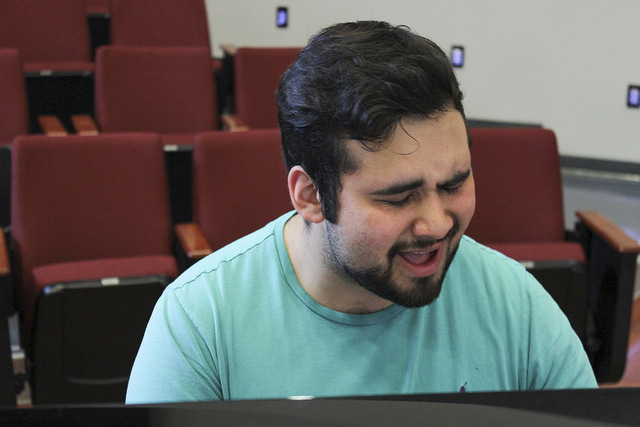 Gabe Catabran is the lead baritone on American River College’s vocal jazz ensemble. Catabran is a part of VJ1, the audition-required section of the jazz team. He has been attending ARC for three years and “plans on transferring soon, maybe in about a year or so” said Catabran. He started singing in an ensemble in high school, then eventually he joined the choir at ARC. Catabran originally sung classical music, and was a part of ARC’s classical group the Chamber Singers. Arthur LaPierre, the director of the vocal jazz ensemble, worked as Catabran’s personal voice coach. “Gabe is steadily improving, his overall musicality has much improved this year,” said LaPierre. LaPierre was a big part of Catabran’s decision in making the switch to jazz. “I really like both of them but I like jazz more. My ear likes the thicker cords,” said Catabran. On Apr. 10, ARC will be one of the six ensembles in the country performing at the Monterey Next Generation Jazz Festival. “This will be my first time going, and I’m really excited.” said Catabran. He credits Kurt Elling, American jazz vocalist, as his biggest musical inspiration at the moment. “(Elling’s) musical achievements are incredible. I even drove to Stanford to see him perform,” said Catabran. Joe Gilman, professor and occasional pianist for ARC’s vocal jazz ensemble, has been working with Catabran for a little over three years. Catabran will also be performing in the vocal jazz ensemble concert at ARC on March 16. Be the first to comment on "ARC student set to perform for the first time in national jazz festival"